I wonder what the difference is between a water sucker and sword sucker? A pic showing the two would be very helpful for beginners learning about bananas. A water sucker looks more like a midget plant and is said to be a small fruit bearer and a weak plant. A sword sucker has thin pointy leaves and is said to be what you should save for propagation or as a replacement for mom. They tend to grow well and look nice as small plants because they get true leaves earlier than the sword suckers, but have less well developed root systems and seem to lack vigor throughout their life cycle, in my experience. Remove them and use as ornamentals, but not for fruit production. These are both about 6-8" tall - one obviously looks like a little banana plant (water sucker), and the other will be much taller before it has any true leaves (sword). Thanks for the pics! Now I know all the pups around my plants are swords and should be good for fruit. 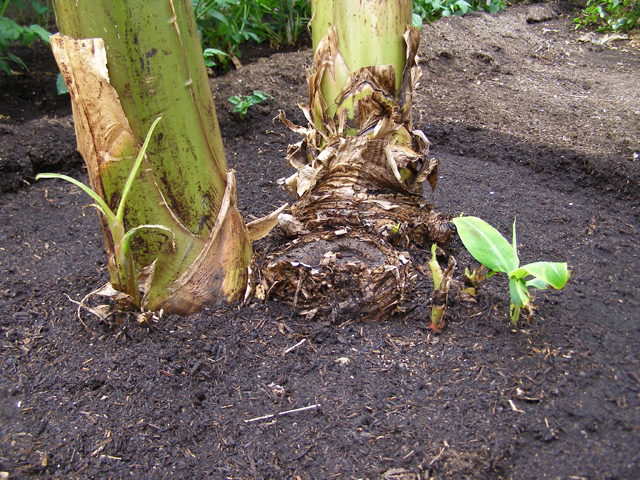 Now the dilemma of letting them just grow naturally and creating a thick banana patch, or relocating them to different places. I was getting ready to discard the swords on my mysores, saba and basjoos. guess will wait till they are decent height and transplant. do the suckers hinder the moms growth? Great thread, I would like to follow it. Thanks for the pictures, guys. That really helps distinguish between the two. 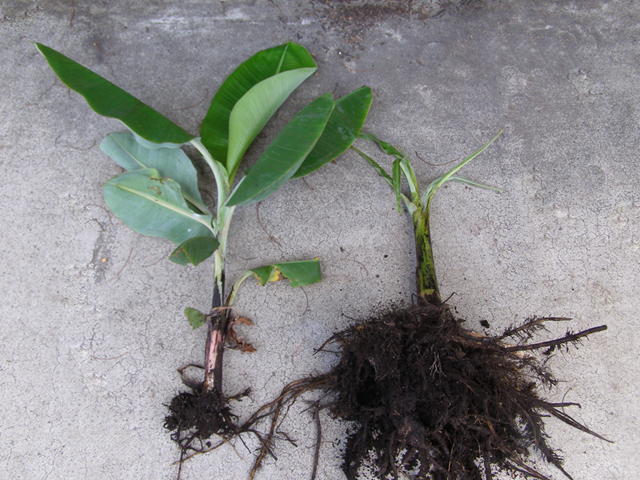 Here is an example of the huge difference in root development and corm size between water and sword suckers. Both are Goldfinger pups removed at the same time from the same parent plant. Is it possible to grow water suckers and have them form sword suckers? Good question Dean. My dwarf Cav seems like all it gives are water suckers. Wow, the difference is amazing. That picture really shows it all very well. Water suckers must be so weak. Excellent pics Pitanga! Thanx for illustrating what I was trying to explain.